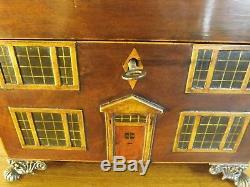 ANTIQUE MAHOGANY REGENCY HOUSE TEA CADDY. 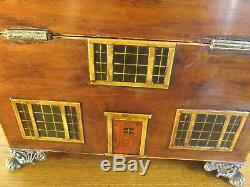 1820's WE HAVE FOR SALE A HIGHLY COLLECTABLE TEA CADDY. 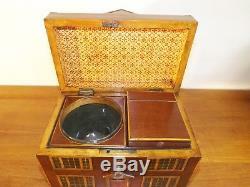 THE TEA CADDY IS IN MAHOGANY AND BOX WOOD AND IS IN WELL MAINTAINED CONDITION FOR ITS AGE. 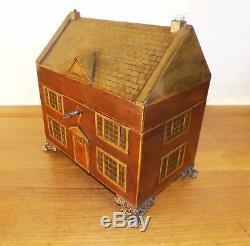 IT IS IN THE SHAPE OF A STUNNING HOUSE. THE ROOF IS SILVER GILDED TO LOOK LIKE SLATE TILES WITH A PAIR OF CHIMNEYS. ONE OF THE CHIMNEYS HAS A SOLID SILVER BIRD SITTING ON IT'S NEST, FOLD BACK THE BIRD TO REVEAL THE EGGS IN THE NEST. THERE IS A DORMER TO FRONT WITH FINE BOXWOOD DETAIL. THE FRAMES ARE MADE OF SOLID BOXWOOD WITH HAND PAINTED BAR WINDOWS. 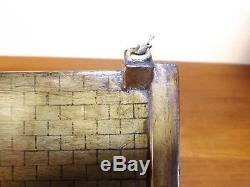 THE CORNERS AND EDGES HAVE FINE BOX WOOD GIVING A NICE DETAIL AND HARDNESS TO EDGE. PAINTED PANELLED DOOR WITH PORCH TO FRONT AND DOOR TO REAR. 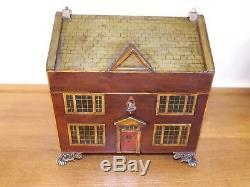 INSIDE HAS A LIDDED LIFT OUT CANISTER WITH FINE BOX WOOD INLAY TO EDGES FOR TEA STORAGE WITH TRACES OF LININGS INSIDE. 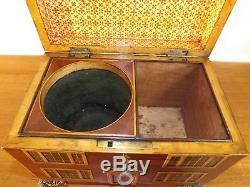 NEXT TO THIS SITS A LIFT OUT GLASS SUGAR/MIXING BOWL WITH NO DAMAGE, WHICH SITS SNUG IN ITS HOLDING COMPARTMENT. FULLY WORKING LOCK AND KEY. SEATED ON FOUR BRASS PIERCED FEET. PATTERNED PAPER TO INSIDE TOP LID. 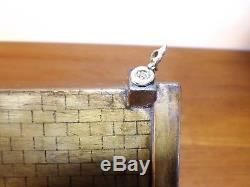 STOP HINGES TO LID IN GOOD STRONG CONDITION. 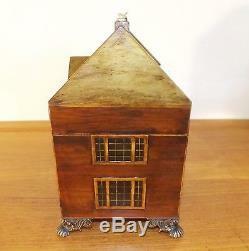 A WELL MADE STRONG TEA CADDY. I WOULD DATE THE CADDY TO AROUND THE 1820'S. I HAVE TRIED TO GET MANY GOOD PICTURES OF THIS GRAND CADDY TO SHOW ITS MANY FEATURES. DOES LOOK SUPERB ON DISPLAY. WILL BE A CENTER PIECE TO ANY COLLECTION. SIZE : HEIGHT 25cm (9 7/8") LENGTH 24.5cm (9 5/8") WIDTH 15.6cm (6 1/8) AS WITH ALL USED ITEMS THERE WILL BE SOME SIGNS OF AGE RELATED MARKS AND WEAR. WILL LOOK SUPERB IN ANY HOME OR OFFICE. 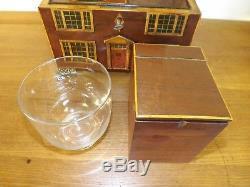 The item "Mahogany House Tea Caddy With Bowl And Bird. (Regency 1811-1820)" is in sale since Tuesday, April 17, 2018. 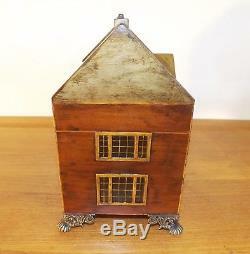 This item is in the category "Antiques\Woodenware\Tea Caddies". 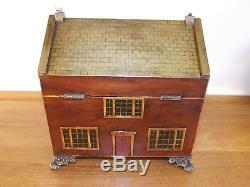 The seller is "regencyclassic" and is located in City Of Brighton & Hove. This item can be shipped worldwide.